Landscape edging is a permanent, hard material that supplies a crisp edge between areas of the garden. Here’s a guide to using landscaping edging in your yard. Edging should be set firmly in place. Otherwise mowers, garden carts, children, or your own shoes can unsettle it, and you will be repeatedly resetting materials. A wide range of materials is suitable for landscape edging. The material you choose should be based on function, style, and cost. Lawn & Garden Divider: As a divider between the lawn and garden bed, edging can be as simple as a trenched edge or a V-shape ditch. Mowing Strip: Use a flat, wide material, such as brick or flat stones, to create a firm base suitable for the wheels of a lawn mower. Mulch Capture: To keep a heavily mulched bed in place, use a material that extends at least 2 inches above ground (and 4 inches below). 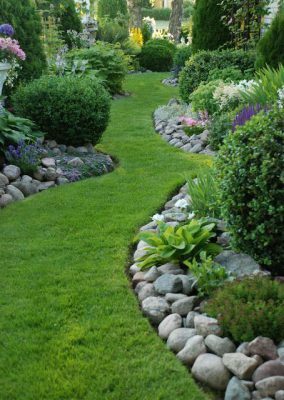 Beauty Edging: If the edging is purely aesthetic, your imagination can run free. When selecting a style of edging for your garden, consider the other materials in the garden. 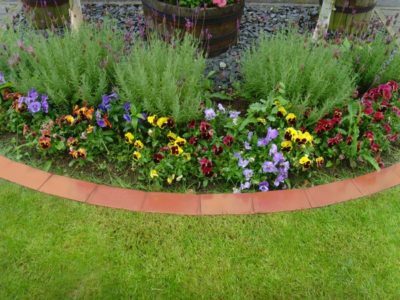 Edging can be a strong unifying factor, but if it introduces a new material to the garden scheme, the wrong choice can be a distraction. Brick, stone, or pavers can unify the edging with a patio or path. Fencing can help connect to a pergola or trellis. Low shrubs can blend into the planting beds for a defined but natural look. Unexpected materials, such as tile or glass, can be used with standard edging materials to match accents from other garden areas. Costs depend on the material type and quantity. Repurposed stones may be free; tiles or brick may be very expensive. If an expensive edging material is your dream, think about using it sparingly. Consider using the expensive landscape edging material only in areas that will be seen up close and often, such as the front yard, or use it as an accent near garden focal points. More affordable materials can be both pretty and practical elsewhere in the garden. In addition, include the cost of installation in your landscape edging plans. The installation cost of different materials varies, as does the ease of doing the installation yourself. Some materials require professional installation or special tools to get the desired look. Others lend themselves to an easy do-it-yourself project. The color of the edging has a big impact on the overall perception of your garden. Use landscape edging in a color that either complements or clearly contrasts with the surrounding foliage and flowers. In casual settings, link the edging to the garden bed by using plants of a similar color or tone. For more formal beds and edging, use uniform materials, such as steel, wood, brick, or prefabricated masonry. Brick: Elegant and long-lasting, brick comes in a multitude of styles and is a good idea for a uniform look. Plastic: Affordable and easy to install due to its flexibility, plastic edging comes in many grades. The least expensive looks it, so invest in the best you can afford. Concrete: You can purchase preformed sections of concrete edging that are ready to be set in place, or you can make a simple form and create a custom edge. Wood: Affordable and easy to work with in straight lines, wood adds an informal, organic look. Count on wood edging to last about 10 years. Stone: One of the more versatile edging materials, stone can be carefully set in mortar for a refined look or placed more casually for a relaxed appearance. Wattle: This edging uses a technique that involves weaving saplings of pliable wood, such as willow or dogwood, into a low fence. Wattle works well for holding back mulch. This entry was posted in Style, Uncategorized and tagged landscape edging.